Named after bare knuckle boxer Daniel Mendosa who visited Norwich in 1790. Part of Lot 7 in the sale of Most Desirable Brewing and Malting Establishment, Tavern and Spirit Vaults, Baking Office and Building Land offered for Sale by Auction Friday 28th June 1844 at the Direction of the Proprietor, Mr. Thomas Massey. Lots 1 to 5 were pieces of Freehold Land near St. Stephen's Gates. Lot 6 was the Baking Office fronting the road from St. Stephen's Gates to St. Giles Gates. Lot 7 was a Dwelling House adjoining Lot 6 and the Brewery. At the entrance to St. Stephen's Square was the Spirit Shop and Tavern, comprising besides the corner Shop, a Porter-room, Kitchen, Cellar, several Bed-rooms, Wash-house, Yard and Privy. To the rear a recently erected Malting Office with 30 coomb steep. The Liquor Shop in occupation of Mr. Garwood, the Malting Office by Mr. Clarke and the remainder of the Proprietor. Lot 8 was land adjoining Lot 5 with a Blacksmith's Shop and other Erections. Given as the CHAMPION STORES in 1890. Advertised as the `nearest Lacons House to the Bus Station' 1966. Including glazed tile facings to the corner entrance, the doorcase and lamp over on the Chapelfield Road facade. Etched glass on doors and windows. Retains three bars, lounge bar, snug and public bar. The corner public bar retains many nice typical features of a small period local, including leather strap hinges on the front door, draught screen, matchboarding; fitted wooden benches, lincrusta ceiling, original lighting fixtures now converted to modern use. Brass latch on door, coat pegs; all pre-war. Hatch to snug, modern bar counter. Named after the London Jewish prize fighter, Daniel Mendoza, who visited the City in 1790. 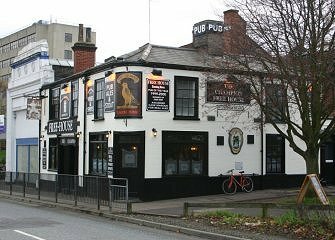 Late in 1985, the pub changed its sign to that of a champion horse. One of the few remaining buildings of the first artisan suburbs to be built outside the City Wall in the mid 19th c.